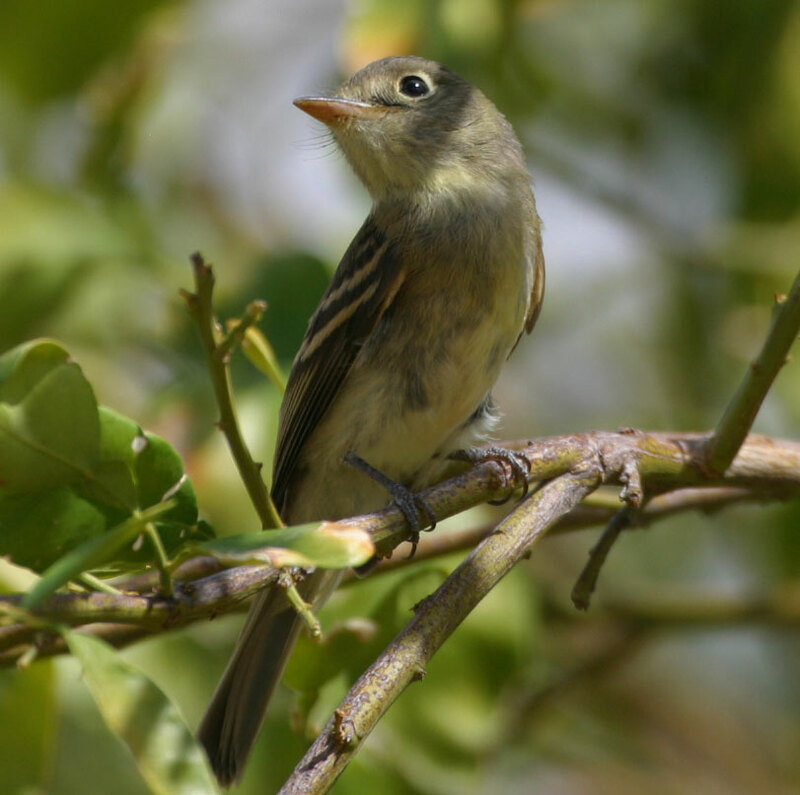 This empid was observed at the Dateland Date orchard on 22 September 2007. Cindy and I watched it at length over a 30 minute period while it foraged actively and frenetically. 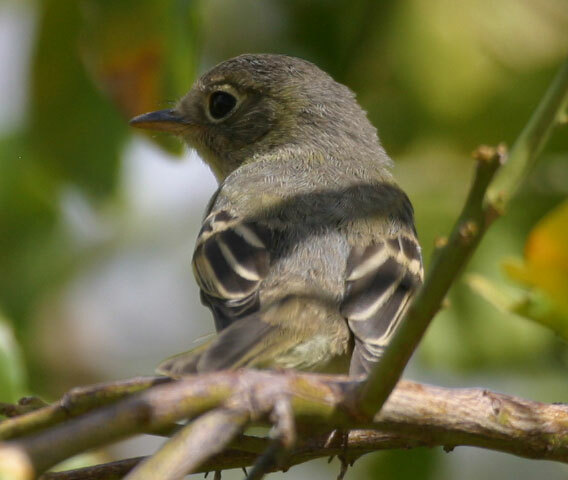 Overall it was gray-green above and yellow and olive below with a very short broad bill and dark "blackish" wings, with bold white wingbars and tertial edgings. 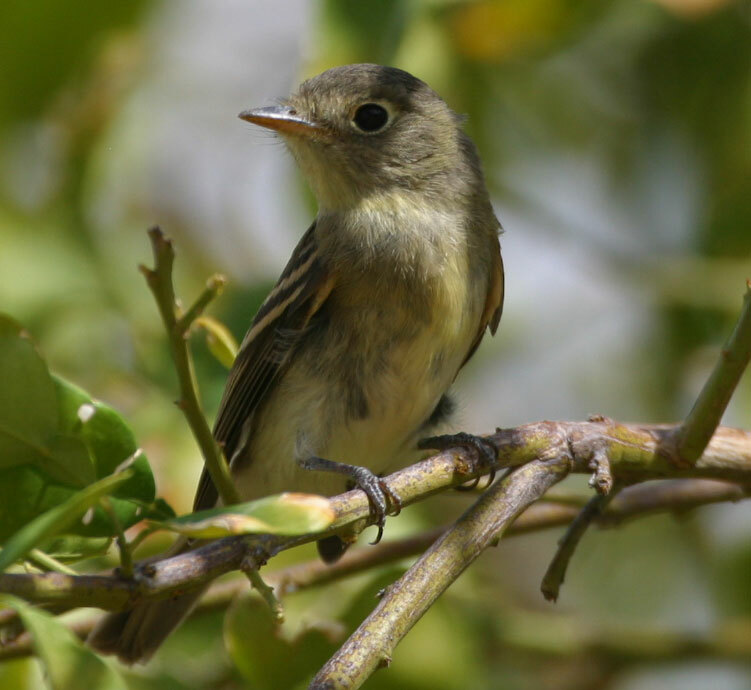 The throat was a grayish yellow, the breast was olive gray and the belly yellow. The bill was entirely pink-flesh below, quite short and broad. 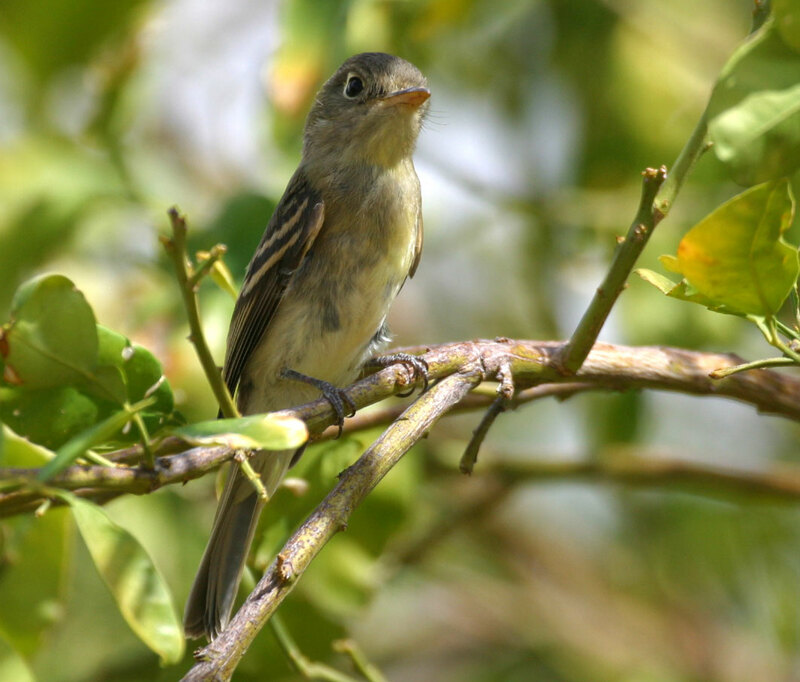 The primary extension seemed medium to short and the tail medium to long.The crown and nape was gray and contrasted with the throat and cheek, the grayish head reminded me of Hammond's Flycatcher. The eyering was prominent and was of even thickness throughout except for a slight widening behind the eye. 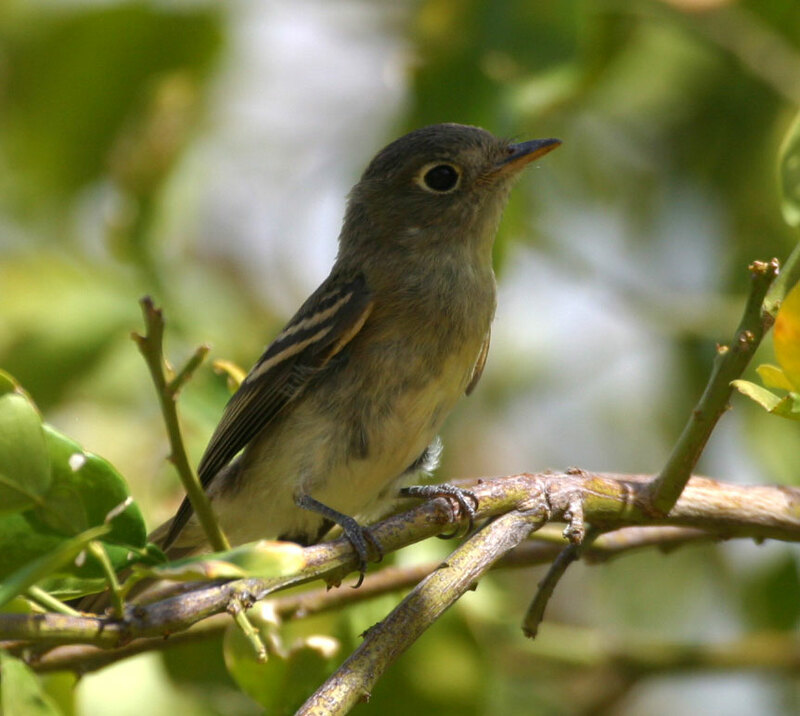 It seemed un-western flycatcher like, because of its rounded head and lack of any crest, even in the wind! I noted a classic looking "Western" nearby that was brownish, worn and drab, and it had a distinctive crest. and lacked the contrast in the wings. 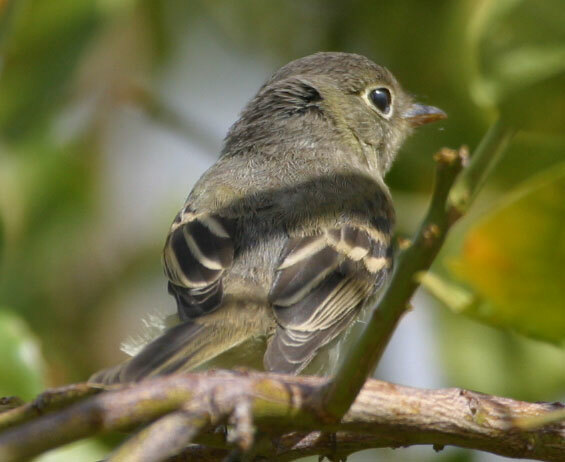 The coloration of the bird also seemed a bit odd, it was green and gray, like a Hammond's, not brownish and olive-green like most "Westerns" The gray crown and nape contrasted with the face and throat! The eye-ring also seemed un-western like being of even thickness throughout, with just a bit of widening behind the eye. In my experience the eyering of most westerns is thin along the top and widest behind the eye with a distinctive point. The underparts were mostly yellow with a wash of olive green on the breast and flanks. The primary projection was medium, the tips of the primaries projected just a bit beyond the upper tail coverts. The tail seemed medium to long (bad for yellow-bellied) but I'm not sure what long or short really means in this case? One thing I noticed in the photos, but not in the field, is the yellow on the bend of the wing. Apparently this is a good mark for YB, in Western it is buff colored. I did hear a single loud "skreep" call, that I thought was it, but I'm not certain.